Amidst the continued challenging business environment, Bharat Heavy Electricals Limited (BHEL) has registered quantum growth in its profitability and order booking in fiscal 2017-18, ending the year with significant traction in growth drivers. This was stated by Atul Sobti, Chairman and Managing Director, BHEL at the 54th Annual General Meeting of the company on 19 September. Addressing the shareholders, Sobti said that during the year, the company achieved a profit before tax (PBT) of Rs.1585 Crore, compared to Rs.628 Crore in the year before, registering a surge of 152%. Net profit (PAT) for the year jumped 63% at Rs.807 Crore, against Rs.496 Crore in the previous fiscal. Maintaining the trend of topline growth for the second consecutive year, BHEL has recorded a turnover of Rs.27 850 Crore, as against Rs.27 740 Crore in the previous year. Consequently, a total dividend of 91% has been declared on the enhanced equity share capital post bonus for the year 2017-18, maintaining the track record of paying dividends uninterruptedly since 1976-77. Notably, this is the highest dividend paid by the company in the last four years, he added. The CMD said that the company delivered a resilient performance during 2017-18. Adoption of strategic initiatives resulted in significant progress in enhancing profitability and productivity, reinforcing leadership in the power sector, and strengthening non-power business areas. These achievements, along with the strategies in place, are strengthening BHEL’s pre-eminent position among national assets and assuring its continued contribution in building a ‘New India’, he said. BHEL booked orders worth Rs.40 932 Crore in a shrunken and highly competitive business environment during the year – a quantum jump of 74% over FY 2016-17. Significantly, BHEL reinforced its leadership position by securing all orders for main packages of thermal power projects during the year 2017-18. With this, BHEL has ended the year with a total order book of over Rs.1 18 000 Crore – the highest in the last five years, said Sobti. The CMD informed shareholders that some of the major orders won during the year included three 800 MW Patratu – the largest power project order on EPC basis ever placed in the country through international competitive bidding; two 660 MW Udangudi; one 660 MW Panki; one 660 MW Bhusawal; steam generator package for two 700 MWe nuclear power plant at Gorakhpur [Haryana], 30 WAG-9H electric locomotives and 146 sets of 25 kV AC IGBT based three phase electrics for mainline EMU trains from Indian Railways, among others. Leveraging capabilities in the emission control equipment business, BHEL has secured Flue Gas Desulphurization (FGD) orders for 17 thermal units till 31 March 2018. The company’s diversification efforts gained traction with the receipt of the highest ever orders in solar power in megawatt terms and a breakthrough order in the municipal segment for construction of six sewage treatment plants at Raipur. This will help in strengthening capabilities of BHEL in emerging areas, he added. Sobti said that during the fiscal, 4149 MW of power generating capacity was commissioned/ synchronised. In addition, 170 MW of solar PV plants were commissioned by the company. With this, the worldwide installed base of power generating equipment supplied by BHEL has exceeded 183 GW. Three 110 MW Kishanganga hydroelectric project, successfully executed by BHEL in the remote and difficult terrain in Jammu & Kashmir was formally inaugurated and dedicated to the nation by the Hon’ble Prime Minister, Sh. Narendra Modi ji. With this, BHEL has contributed over 40% of the installed power generating capacity in J&K, with more than 40 commissioned sets with a cumulative generation capacity of 1652 MW. With its innovation-led growth strategy, the company invested more than 2.5% of its turnover, to the tune of Rs.753 Crore on R&D during the year. 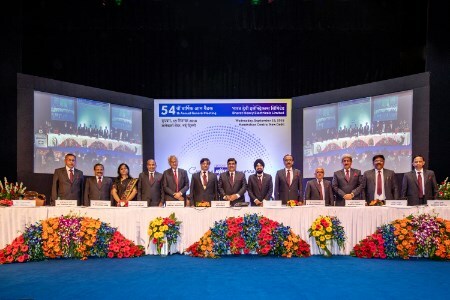 During the year, BHEL also filed the highest ever 530 patents and copyrights in a year, enhancing its intellectual capital to 4357 patents and copyrights filed, for productive use in the company’s business. Keeping future requirements at front, the company is focusing on outcome based Engineering & Technology initiatives, said the CMD. Significantly, BHEL has designed and developed state-of-the-art IGBT based 3-phase drive propulsion equipment for India’s first-ever air-conditioned AC EMU train for Mumbai suburban application The propulsion control system incorporates regenerative electrical braking, yielding substantial energy savings. This AC EMU has been successfully running for passenger service since 25 December 2017, covering more than 100 000 km and providing safe and comfortable journey to commuters in Mumbai, he added. Sobti informed shareholders that India, the fastest growing major economy in the world today, is envisaged to become a USD 10 trillion economy by 2030. This will translate into humongous demand and opportunities in energy and infrastructure sector. The government is also targeting 100% households’ electrification by the end of this year. This improvement in accessibility and availability of electricity, which is likely to spur its demand and consumption, is one of the most significant changes underway in India’s power sector. In addition, railways, ports, urban infrastructure, environmental solutions, and core industries like cement, coal, steel and petrochemicals are slated for massive investment in the coming years to fuel India’s growth aspirations. This is bringing many more opportunities for the company, particularly in the areas of clean energy, energy storage, e-mobility, emission control equipment, urban transport and infrastructure development, among others, he added. Looking to the future, he said that this is a significant moment for BHEL to move to the next level of performance by converting emerging opportunities into potential success stories. Therefore, the company has embarked on a transformation journey of ‘Creating BHEL of Tomorrow’, with the threefold objectives of enhancing responsiveness to emerging opportunities, building new levers of robustness and laying foundation for a sustainably rising BHEL. The CMD said that to move towards the vision of becoming a global engineering enterprise, BHEL will continue to focus on globalisation and diversification to increase business from non-coal areas, and further strengthen its Innovation capabilities. Accordingly, the company has created and restructured business verticals for emerging opportunities. Development of technologies such as advanced ultra-supercritical technology for power generation, propulsion system for electric vehicles and conversion of coal to methanol have been taken up in mission mode. Alongside developing technologies in-house, BHEL is collaborating with global technology leaders and has entered into technology collaboration agreements with ISRO for Li-ion cells and Kawasaki Heavy Industries for stainless steel metro coaches. Several corporate social responsibility initiatives in the form of socio-economic and community development programmes undertaken by the company are aligned with national priorities so as to have an amplified impact on communities around. BHEL continues to serve society through its contribution in education, health, skill development, and improvement in the living conditions and hygiene in villages and communities spread across the country. BHEL has been actively involved in the skill development initiatives of the Government of India. During 2017-18, the company provided skill development opportunities to more than 24 000 individuals under various schemes like Graduate apprenticeship, Diploma apprenticeship, Vocational apprenticeship, Trade apprenticeship etc. BHEL was recognised as Champion of Change under the category of ‘Best Central Public Sector Enterprises’ by the Ministry of Skill Development & Entrepreneurship for engaging maximum number of apprentices under the Apprentices Act, 1961, said Sobti. BHEL’S sustained efforts towards conservation of energy, deployment of energy efficient measures and installation of renewable energy based systems in its operations are the company’s contribution towards protecting the environment. From its various solar-power related initiatives alone, BHEL achieved carbon footprint avoidance to the extent of 15454 MT CO2-e during 2017-18. In addition, the company is also actively supporting various government initiatives, such as 'Swachh Bharat', 'Clean Ganga' etc. The CMD said that BHEL’s immense contribution in nation building endeavors makes it the finest example of successful ‘Make in India’ and the company is committed and ready to take this mission forward in building a ‘New India’.